Home » 5 Freshest » Botan Rice Candy: 1962 called. They want their box back. Botan Rice Candy: 1962 called. They want their box back. The Botan Roce Candy is old school. I remember eating these occasionally as a kid, and now I’m old, so these have been around a long time. You don’t need me to tell you that, just look at the box. I’m going to wager a guess that the packaging hasn’t changed a whole lot since its inception (the date of which I can’t find). The small cardboard box has basic colors and pictures. It’s also small – you only get 6 pieces. The flavor is orange/lemon but I taste more orange than lemon and it’s all very light. 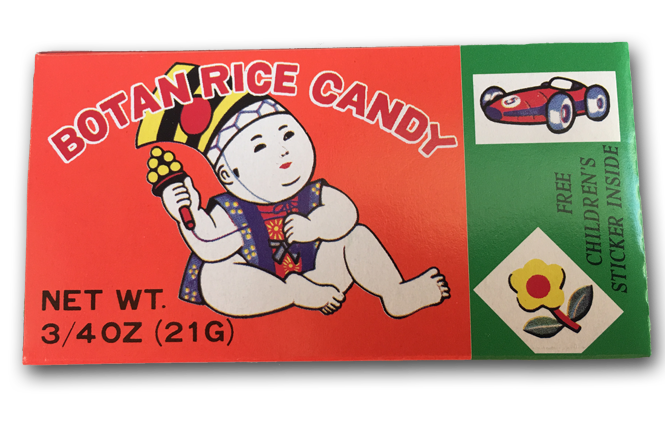 From the small box with a sticker (they used to include a plastic toy but stopped that last century) to the novel rice paper around the chewy candy that can also be eaten, make no bones about it, Botan is for the children. The candy itself isn’t bad. It feels a bit like a soft gum going in and then disintegrates pretty fast but you still get some chew from it. It’s not too sweet either, and according to Wikipedia, all the pieces in the package add up to 60 cals and 2 grams of sugar. So you can give it to the kids every day! Thanks to Grace the super fan who sent these to us because I wouldn’t ever buy these for myself. But when I’m Grampa, I could see throwing a box or 2 into the Xmas stocking. The kids will find them fun to eat with the rice paper coating, plus they get a sticker. What more do they need? Nothing. Kids are spoiled. These gave me flashbacks. Not sure if they’re good or bad, but I’m flashing. btw the candies are grapefruit flavored!! yea they might be. The interwebs says they are orange and lemon which is kinda grapefruity huh. ok then! What?! I didn’t know that the flavor was grapefruit. I always thought that they were just Japanese baby flavored, lol. Brings me back to my youth and getting so excited about the sticker that came in the box.